St. Baldrick’s of Clinton County, a volunteer-driven charity dedicated to raising money for childhood cancer research, will host its 8th annual head-shaving event at the Community Center/Lincoln Park in DeWitt on Saturday, March 24th at 11:30 a.m. We will share some family’s stories of their journey through pediatric cancer as well as Dr. Sue O’Dorisio, MD, PhD from the University of Iowa will be speaking about what this research means. We will be showcasing the shavees and their commitment to raising funds and walking in solidarity with children battling cancer. Shavees can become heroes for kids with cancer by shaving their heads in return for pledges of financial support from friends and family. Participants find that shaving their head in solidarity with children who are diagnosed with cancer each year, often losing their hair because of treatment, is a small sacrifice in comparison to what these children endure. This year in addition, the head shaving there is a new part to the event called “Short Hair Don’t Care”. For those people wanting to become heroes for kids with cancer but not ready to brave the shave, we have created a “Short Hair Don’t Care” part to the event where people can donate 8 or more inches of their hair to an organization that gives wigs to kids affected by cancer. Why all the shaved heads? Because, every two minutes a child is diagnosed with cancer, and one in five of these children will not survive. Those who do survive often suffer long-term effects from treatment too harsh for their developing bodies. Kids are special, especially when it comes to cancer treatment and the St. Baldrick’s Foundation understands the need to treat them that way. Kids deserve the chance to be kids – fun loving, carefree, refreshingly honest, and always a little goofy. Donations raised at events like this support the development of childhood cancer treatments that are as unique as every kid is. Since starting the event in 2011, St. Baldrick’s of Clinton County has raised over $200,000 to support the development of childhood cancer treatments and research throughout the state of Iowa, directly affecting children in our community. The event will kick off at 11:30 a.m. on Saturday, March 24th at the DeWitt Community Center in Lincoln Park. The head-shavings will commence at 1:00 p.m. There will be food, music, kids’ activities, a bake sale and silent auction. The committee is in need of barbers, volunteers and shaves or those who wish to donate hair. 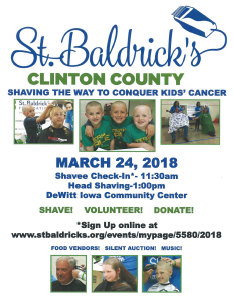 Those interested in helping are asked to register at https://www.stbaldricks.org/events/mypage/5580/2018 Stay up to date with St. Baldrick’s of Clinton County by liking their Facebook page: www.facebook.com/StBaldricksClintonCountyIowa. Questions? Contact Julie Burken at 563-249-7663 or wjburken@iowatelecom.net.